The Temple Canton is considered the holiest place in all of Vvardenfell by the Dunmer. It is not only the headquarters of the Tribunal Temple, but it is the home of the man-god Vivec. This canton is the place where you must go in order to get back into the Temple (should you be expelled). It is also the most heavily guarded place in Vvardenfell (excluding the Imperial Legion forts). So if you have accidentally annoyed the Ordinators, it is not advised that you visit here until the Main Quest tells you to. The Hall of Wisdom and the Hall of Justice contain the executive, administrative, judicial and martial operations of the Tribunal Temple. Mehra Milo is a Dissident Priest working in Library of Vivec under cover and your first contact with the group. You'll find many common books here and a Land Deed. In the Office of the Watch you'll find two ranking Ordinators, Tarer Braryn and Elam Andas, who have some jobs for you. A hidden trap door (locked 50 pts. and trapped) leads to the Secret Library of Vivec, which has many interesting books, among them are Progress of Truth and the Galur Rithari's Papers. The Hall of Wisdom is where many Temple staff have their sleeping quarters and their offices. 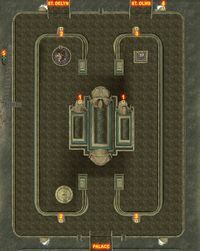 At the base of the canton lies a typical underworks, inhabited by rats and slaughterfish. It can be accessed through the Halls of Justice or Wisdom, or through underwater grates to the northwest, northeast and southeast of the canton. Tholer Saryoni is the Patriarch and Archcanon of the Tribunal Temple, located in his offices behind a locked door. Endryn Llethan is a Quest giver for the Temple as well. There are a great number of shrines giving blessings to the faithful. 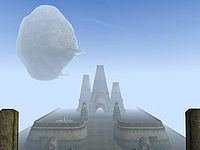 The ministry is a hollow moon floating above the Vivec Temple, which functions as a prison for dissidents of the Temple. When you visit it during the Main Quest, Alvela Saram will provide you with a key to get in. Archcanon Tholer Saryoni, Temple quest giver Elam Andas and Dissident Priest Mehra Milo. Two bridges north connect to St. Delyn and St. Olms, respectively. 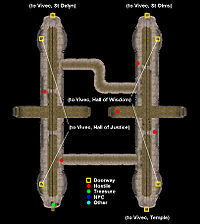 A bridge south leads to the Palace of Vivec. 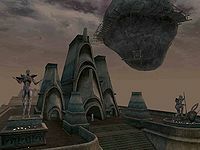 The Gondola on the west side connects to Arena, Hlaalu and Telvanni Cantons. 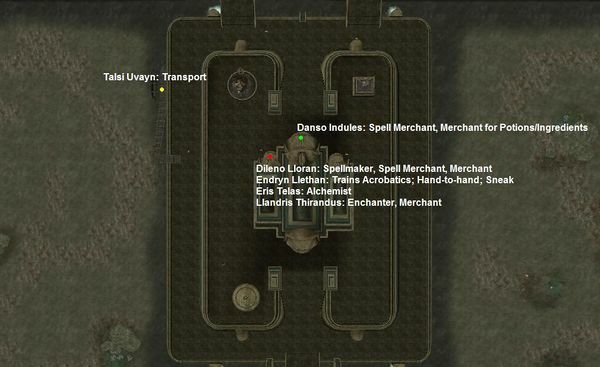 Just outside the High Fane, Danso Indules sells cheap Rising Force potions to use for the Shrine of Daring (a.k.a Shrine of the Moon). Galur Rithari's Papers: Find a very rare book by Galur Rithari about vampirism cause and cure. Land Deed: Save a woman's home by robbing the Vivec Library. The Dwemer Goblet: Give a fancy goblet to a poor priest. Expelled from the Temple: What to do if you are expelled from the Temple. Mysterious Killings in Vivec: Solve the mystery of seven recent murders in Vivec. Dunmer Ordinator 19 175 120 0 30 Outside [4,-12] Unlike most Ordinators, he is not a member of the Temple, and therefore is more likely to be friendly with early characters. This page was last modified on 12 October 2018, at 21:34.